Three Type of Behavior Change: Part of the Content Strategy Basics series. Behavior change is usually an important component of content marketing strategy. 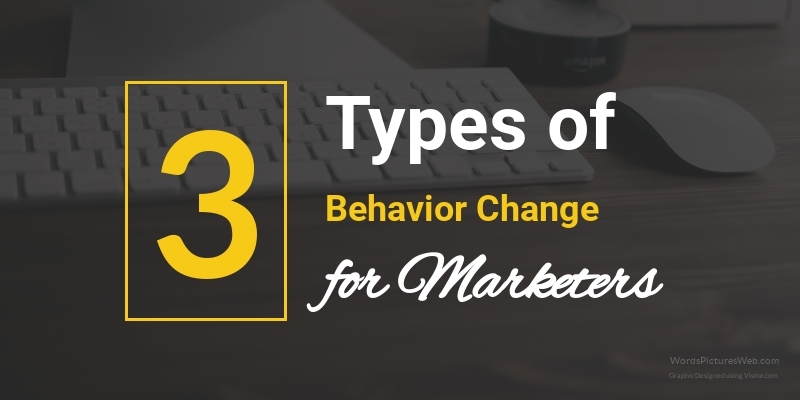 There are many types of behavior change, but you can distill these down to three that matter to brand marketers. Behavior Change #1: Try my product. You’re not using my product, so I will give you reasons to try it. A user may be unaware of your product or may not see it as an option. In traditional funnel terms, this is qualified lead. The desired change is for them to try the product. This is usually bundled with awareness and/or disruption marketing that is designed to trigger an action. The action may be as simple as visiting a website or initializing a search on Google or Bing, but it is an early stage action that may benefit from activities in public relations, advertising, social media, and other related tactics. Acquisition is challenging and often expensive, as compared to other behavior changes. Behavior Change #2: Use my product more. This should be the easiest form of content marketing, but it rarely is. It’s the neglected child of Behavior Change #1, even though it could be one of the most measurable of all of your marketing efforts. The idea is to reinforce the value of your product to drive further use and product loyalty. Some brands have advanced customer relation strategies, including loyalty programs. Yet, if you consider the products that you use, including large purchases, you may find yourself wondering why the brands do not do a better job of nurturing the relationship with you as a consumer. Many customer relationship marketing efforts lean heavily on social media and email as their go-to strategies for ongoing communications. After the cost of acquisition, the failure point often disintegrates here. In his book “Hug Your Haters” Jay Baer talks about how brands can increase their customer engagement or ruin it completely. Behavior Change #3: Tell a friend. This is not a new concept, but it is the most effective, scaleable, and challenging of all. The idea is to get loyal customers to be brand evangelists who advocate for your brand. Word of mouth marketing is certainly not new. A commercial from the 70s featuring Heather Locklear explained that you’ll be so happy with a new shampoo that “you’ll tell two friends, and they’ll tell two friend…” and exponentially increase the viral socialization of a brand that they love. Tell a friend is now part of every social media campaign, and for good reason. We are all now connected through social media channels and will add a jetpack to your brand value proposition. Are there nuances to these behavior changes? You bet. It’s one thing to make someone a brand advocate, but something else to get them to evangelize it. Not all brands lend themselves to brand evangelizing. For example, much of my career has been working with healthcare and pharmaceutical brands. Health is a deeply personal matter, so many people do not want to discuss their medical conditions in public forums and across social media. And yet, many still do. It depends on the nature of the health condition and the community. Later, we will discuss some of the ways that you can use social media and other channels to enable brand evangelists to share their success stories. This entry was posted in content, content strategy, Content Strategy Basics, Marketing and tagged behavior change, content marketing, content strategy, social media by Buddy_Scalera. Bookmark the permalink.